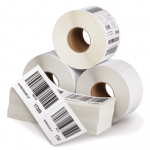 Labels can be printed “in-house” using different print technologies. 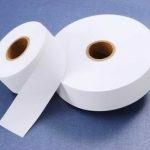 One of the most popular methods is called thermal transfer printing which uses materials that has a thermal transfer coating and is to be printed with thermal transfer printer ribbons of various formulas. This technology requires heat to transfer a printed image, unlike other printing methods such as laser toner or ink jet process. 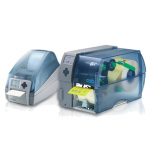 Thermal Transfer printers may also print via Direct Thermal which does not require a thermal transfer ribbon. 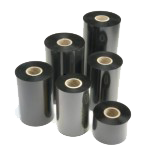 Direct thermal printer uses a special coating on the label or tag material that changes to black when in contact with the heated thermal print head. One printer may be able to do either Thermal Transfer or Direct Thermal through changes made in the software and/or on the printers settings. 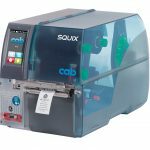 With the popularity of variable printing and the need for durable labels, the number of thermal printer manufacturers have grown as have the number of printer models. They range from small desktop units to heavy-duty industrial systems. Fortunately, the mechanisms that drive the printing media are somewhat consistent in the use of the thermal print head. 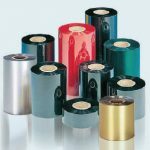 Thermal Transfer does require a printing ribbon wound on a core, either 1/2″ or 1″ inner diameter. To make their printers more unique, some manufacturers deliberately designed their printers to use unique cores. Some require extra take-up cores, while others have special notches to lock the cores onto the printers correctly. Ribbons are usually wound on cardboard cores, but plastic cores are also available which are usually needed in clean room environments. 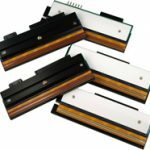 Some printers require specific leader strips to feed into the printer while others have special trailers at the end of a roll to alert the printer’s sensors that you are about to run out of ribbon. Some ribbons are wound coated side out while some are wound coated side in and must be properly fed through a printer to get an image. The choices can be confusing and overwhelming! Let Eagle Wright help you with choosing the correct printer and supplies, we have a wide variety of paper and film label materials, thermal ribbons, and Printers available.